Transportation - Kumpfort Zone Warehousing Inc.
You can trust the experienced team at Kumpfort Zone to put our 3PL fleet of GPS Satellite tracked late model tractors and trailers at your disposal. 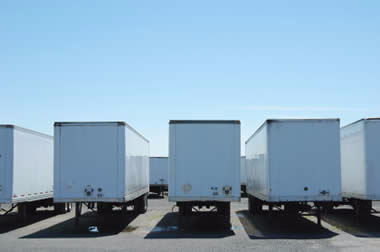 Whether you are looking for LTL, FTL, roll tite, or a flat bed, we can provide service throughout North America. You can be rest assured that your load will arrive at its destination on time, everytime. We offer same day service and can help you move your excess freight, even LTL if needed. For those occasions out of your control, such as a driver calling in sick or taking holidays you can count on our safe, courteous drivers to get your freight where it's going, on time, every time. We can be that little bit extra you need to keep your clients happy, just a phone call away. 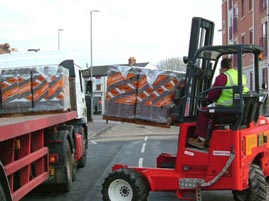 The Moffett Mounty forklifts are the most flexible portable delivery system on the market. We can deliver where you want, when you want, even over rough ground conditions. we can make your business better.